The problem with sitting at the executive level, is you might wonder if you’re making the best possible decision for your company. There really wasn’t a great way to see into the future to how your final call would impact the enterprise. But with TTL, you can make the right decisions, with total assurance, and way faster than you ever thought. It would be amazing to have someone by your side as you evaluate new technologies, help you make the right selection for your industry and needs, present the executive case to your team and then design the implementation plan. It would be even more amazing if you got to take all the credit. Sometimes you’re not sure to invest time to take a vendor demo. Or you would just like that last bit of validation (or caution) in making that all-important selection. Our Provider Snapshots are designed for these times! Talent Tech Labs Provider Snapshots offer you Talent Acquisition recommendations so you can make your Talent Acquisition Technology decisions with confidence. Before you invest your valuable time and resources in evaluating (or purchasing) a particular provider’s products, make sure you have all the facts. 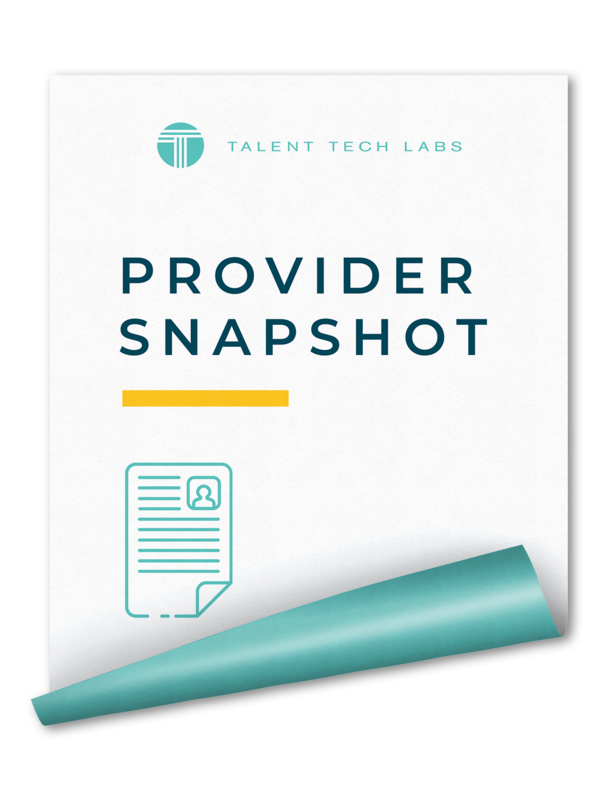 Talent Tech Labs’ Provider Snapshots offer an overview of current product features and vendor functionalities as well as our assessment of where this solution fits best with your company.